He only dons a pair of skates and underwear. Chances are you’ve seen his videos floating around Facebook and Instagram. He pops up when you least expect it, and this time he appeared at a wedding as a ring bearer. The Internet sensation on roller skates is Quis, and he’s one half of the viral-video maestros DQ4E. Over the weekend, Quis was a special guest at Bobby and Shanna Lockhart’s Lubbock, Texas, wedding. 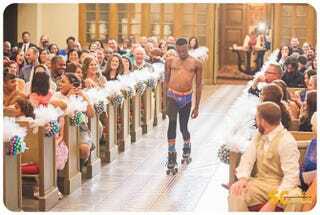 As the best man of the wedding pretended that he lost the rings, Quis rolled in (literally) and did his infamous “Superman Drawls” glide down the aisle. According to Cosmopolitan, Quis is a friend of the groom, and a Redditor caught the whole thing on film. “A friend of mine had his wedding today. The best man is asked for the rings, the groom holds his hand out and the best man plays the ‘I don't have them’ card. Everyone checks pockets … and no one has the rings. Then … this guy rolls in,” the Reddit post stated. Quis and his “Superman Drawls” have put every ring bearer to shame.